A new organisation aims to improve the performance of small and medium businesses within the automotive engineering supply chain. Enscite, supported by the European Regional Development Fund and the Regional Growth Fund, has been launched to help automotive manufacturing businesses grow. 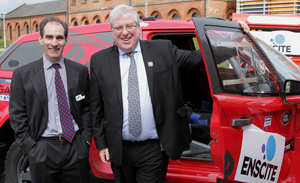 To mark the occasion Rt Hon Patrick McLoughlin, Secretary of State for Transport, delivered a speech saying he was pleased to back the organisation that will enable companies within the transport sector to take these skills and opportunities even further. It will offer a range of support services to the SMEs operating within or wanting to access the aerospace, automotive and rail sectors. Colin McKinnon, Managing Director of Enscite, said: “It works to help manufacturing businesses to grow and thrive. Utilising the expertise of our world-class partners, we deliver practical business improvement programmes, run supply chain workshops and leverage funding to support investments in new technology, including access to a £1m Technology Fund. The launch event, held at Derby’s Roundhouse, was attended by more than 190 guests from organisations across the automotive, aerospace and rail engineering supply chain. Partners of Enscite, Derby City Council, University of Derby, Aston University and Cranfield University, were also in attendance.